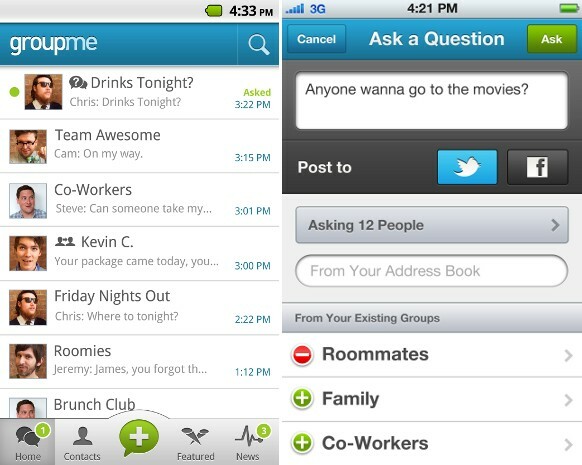 Groupme, the little group messaging service that made a bit of a splash at Google I/O, turns 3.0 today. There are some shiny new features on board, including a simpler way to exchange private messages and “Questions” for sparking conversations when you’re not sure who to talk to. But, the big news — Groupme 3.0 is now platform and nation agnostic. With the latest update, the service will be available in 90 countries and add Windows Phone 7 to its list of supported OSes, alongside iPhone, BlackBerry, and Android. Even if you’re sitting in front of your desktop you can still take part in the mass messaging fun. The website has been overhauled and now sports all of the same features, like photo-sharing and group management, as the mobile apps. Check out the source link to get the latest version for your handset of choice — provided you’re not a Symbian fan — and don’t miss the gallery below. With the latest update, the service will be available in 90 countries and add Windows Phone 7 to its list of supported OSes, alongside iPhone, BlackBerry, and Android. Even if you’re sitting in front of your desktop you can still take part in the mass messaging fun. The website has been overhauled and now sports all of the same features, like photo-sharing and group management, as the mobile apps. Check out the source link to get the latest version for your handset of choice .